There are several reasons to choose a Litton Glassworking Lathe. Every machine has: precision alignment of the spindles through ground, stress relieved, nodular cast iron beds; hand scraped heads and tails; and precision bearings. While spindle alignment has never been the subject of a guarantee, no lathe has ever left the factory with an accumulated error greater than .002”, for the full extended length. Beds are mounted in three point suspension to eliminate distortion or misalignment that might result from warping or unevenness in mounting on bench surfaces or floors. Precision ground box ways, which maintain high accuracy in flatness and twist, are an integral part of the bed. Spindles and drive parts are mounted in precision anti-friction bearings. Spindle bearings are held to a maximum, non-repetitive runout of less than .0002”. Lathe spindles (except for the KB Series) contain their own packing glands for applying air pressure or vacuum to the bore of the spindles, eliminating the need for swivels or spit tubes. Optional differential orifice valves or computer pressure control systems permit precise control of flow into the work. This feature prevents products of combustion from condensing within the work during the softening process and also permits continuous “floating” with pressure in forming and wall evening operations. The lathes outfitted with seals can work with both pressure and vacuum. An optional selector valve controls the introduction of air in either spindle, or in both simultaneously, by using the foot pedals. The computer option uses the pressure control system and can control both the magnitude and configuration of the blow. Spindles are driven by sprocket and inverted tooth chain. These sprockets are co-generated with the grinding operation from common centers and are an integral part of the spindle. Backlash is controlled by long life fiber shoes, against which the back of the chain rides. The fiber shoe contributes no wear to the chain and has the advantage that no link chatter is produced. Chain stretch is readily taken up by an adjustment of these shoes. In order to preserve precision during the operation of a lathe, where varying degrees of heat are present in the working zone, it is necessary to shield the bed and heads from radiant heat. Cover plates are provided at both head and tailstock, which effectively shield the whole frontal area. The bed is covered by a continuous heat shield extending from under the headstock to the end of the ways. An integrated accessory system permits the interchange of accessories between different lathe sizes, thereby minimizing investment and maximizing versatility. With regard to chucking, a number of methods and accessories have been made available. Burners have been developed primarily to provide the narrowest heating zone commensurate with ample total heat. Fire control is usually by foot pedal, operating a fuel proportioner valve assembly. The fuel valve assembly provides for a standby fire when the foot pedal is fully released. The fuel mixture can be adjusted by a hand valve on the face of the machine that permits manipulation of the proportioner valve while the lathe is in use. Other burner controls include the Burner Control System which is operated by computer. The functions of the Burner Control System can be over-ridden by the computer logic interface control. Of the 49 models of Litton Lathes, the Model F is the smallest. The F Lathe is driven by a variable speed motor coupled to the drive shaft by a small timing belt. The U, H, E, and K Series Lathes have an infinitely variable timing belt drive. A coaxial feature allows the tail spindle to be disengaged while the headstock continues to rotate. The coaxial feature is standard on the U and H machines and optional on the E an K machines. Coax is not available on the longest version of the E series machines. In the E Lathe series, all machines have the same firecarriage and drive configuration. There are three bore diameters available in the series: 98 mm (EE, M, ME), 184 mm (ESA), and 209 mm (ESB). All are available in six bed lengths. The M and ME are greater in radial clearance. The M Lathes have very short legs to accommodate the extended radial clearance above the heat shield such that the centerline of the spindle above the floor is the same as the EE. As a result, the handwheels were designed with extensions for convenient operation. M Lathes can be equipped with hand levers for valve operation, as opposed to foot pedals. The K Lathe series represents the largest of the Litton Lathes. There are nine lathes in this series (K, KS, KT, KA, KSA, KTA, KB, KSB, KTB) and they differ in two basic respects. They come with either standard or raised radial clearance to the bed and in three spindle bore sizes. The S designation refers to an 89 mm (3-1/2”) increase in radial clearance to the bed, the T designation refers to a 178 mm (7”) increase in radial clearance to the bed. The A designation refers to the 210 mm (8-1/4”) spindle bore diameter and the B designation refers to the 260 mm (10-1/4”) spindle bore diameter. ESA Models of the E series and models K, KS and KT of the K series have the same spindle nose configuration. Similarly, the ESB Models of the E Series and models KA, KSA and KTA of the K Series have the same spindle nose configuration. Therefore, although spindle bore diameters are different, faceplates and chucks are interchangeable. Litton lathes have a long field history, lasting 40 years or more. They can be rebuilt and modernized to current design at the end of such period of service. Remote control and automated systems are also available for convenience and safety, not to mention increased productivity. At Litton - quality, innovation, and service are ongoing objectives. Long before the name “Silicon Valley” conjured up images of an emerging center of technology, the area was home to Charles V. Litton, Sr. It was here that his pioneering spirit began to flourish, paving the way for what was to become a gathering place for entrepreneurs and innovators. In 1924, he designed and built the first practical glass blowing lathe- revolutionizing the vacuum tube industry forever. The following year, Litton graduated Phi Beta kappa and Sigma Xi with a degree in electrical and mechanical engineering from Stanford University. 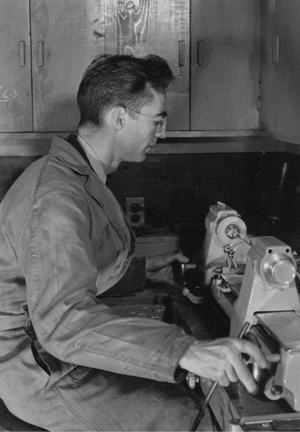 In 1932; he founded Litton Engineering Laboratories, which provided the vehicle that enabled him to continue his research, development, and manufacture of equipment for the vacuum tube industry. His list of accomplishments include 66 patents held on various high-tech innovations, and reads like a history book of American technological achievements. During World War II, Litton participated in the design and production of microwave tubes used in communications and radar equipment. He was awarded the Presidential Certificate of Merit for work he performed on behalf of the National Defense Resource Committee. After the war, Litton Industries was founded for the purpose of manufacturing both vacuum tubes and the machinery used to make them. The company grew rapidly, soon rivaling established electronics firms in the east. 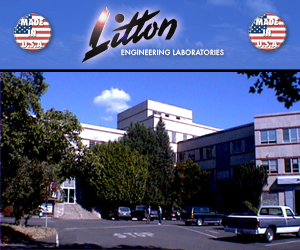 In 1953, Charles Litton sold Litton Industries which retained the vacuum tube portion of the company and soon grew to be a multi-national conglomerate. The following year, he moved the machinery manufacturing division into a large, modern facility in the Sierra foothills. This new home in Grass Valley, California would grow to become a center of excellence – carrying on the traditional established more than 20 years earlier. Over time, Litton passed the torch to his sons, Charles, Jr. and Larry. Embracing their father’s commitment to anticipating and fulfilling the needs of the glassworking industry, they have positioned the company to move successfully into the 21st century.